As some of you will know if you’ve been reading this blog for a while, every year I set myself a little reading challenge. I pick a number, register it on Goodreads, and spend 12 months trying to hit my goal. This year I’m pleased to say that I only have 1 more book to go until hitting my target of 52 books read in 2018 - an average of 1 a week, and much more successful than last year’s attempt. I feel like I’ve really found my groove with reading again this year. I’ve devoured so many wonderful books, and have got back into the habit of curling up with a good novel every night before bed. It’s something I definitely want to continue in 2019, and I have a huge stack of books ready to dive into! Anyway, today I thought I’d share the 10 best books I read in 2018. It was hard whittling them down, but I can hand on heart say that every book on this list is worthy of your time and your money. Enjoy! It’s likely that you’ve probably already heard me banging on about this book, and that’s for good reason - it’s really, really bloody good. It’s one of the only books that has seen me both laugh hysterically and cry in public, and I enjoyed it so much that I actually read it twice this year. I also bought multiple copies for friends and insisted that they did the same thing. Despite the title, this gorgeous memoir is actually devoted to female friendship and how those people we choose to become friends with become knitted into the very fabric of who we are. It touches on everything from flatshares to weddings to inconsolable grief, and it’s without a doubt one of the most moving books I read this year. If you read this post, you’ll know that I’ve been on a bit of a ~journey~ this year with regards to my body and eating, and reading this book was definitely a contributing factor with me wanting to make peace with food after years of dieting. This book was a genuine pleasure to read - it’s a celebration of food as something greater than the sum of it’s nutritional information. I loved the recipes, the anecdotes, and the exploration of how food is so often tied to our most important memories. If you’re fed up with the many clean eating tropes and want to read something joyful about food, this is the book for you. Over the years I’ve got out of the habit of reading a lot of fiction, but when I saw Clean by Juno Dawson doing the rounds, I decided to download it on my Kindle. I’m so glad I did because it was ace, and helped me remember how freeing it can feel to get totally lost in a fictional world. Clean follows the life of Lexi Volkov, the socialite daughter of a powerful hotel magnate, after she is admitted to rehab following an overdose. While the subject matter is deep, this novel is a really pacey read, with interesting characters and pithy dialogue. I’m a huge, huge fan of Nora Ephron, so I can’t believe it took me so long to finally pick up Heartburn, the fictional novel about the breakdown of a marriage that was based closely on Ephron’s own experiences. As with all of her work, Heartburn is funny, moving and incredibly quick witted. I loved the little recipes that were littered throughout, and the everyday, domestic observations that Ephron was famous for. Also, Virago actually re-released the book this year with a beautiful cover, so it will look extra gorgeous on your bookshelf too. I’m sure so many of you reading this post will already have read Adam Kay’s brilliant book about his time working as a junior doctor in the NHS, but if you haven’t, I recommend you pick it up immediately! Written using the diaries Kay kept at the time, this book is an honest, unfiltered look at what it’s really like to be a doctor. It’s equal parts laugh out loud funny and bleakly depressing, and it gave me a whole new respect for those incredible men and women who sacrifice so much to take care of us whenever we need it. I honestly had no idea of the extent of the stress and strain our health workers are under, and for that reason alone, I would recommend that you pick it up. Holly Bourne’s How Do You Like Me Now? was without a doubt the most relatable piece of fiction I read this year. It follows the life of Tori Bailey, an author come life coach who has inspired millions of women around the world to live their best lives. However, her own life isn’t looking quite as perfect as she’d have people believe, and the narrative explores how she comes to terms with that. 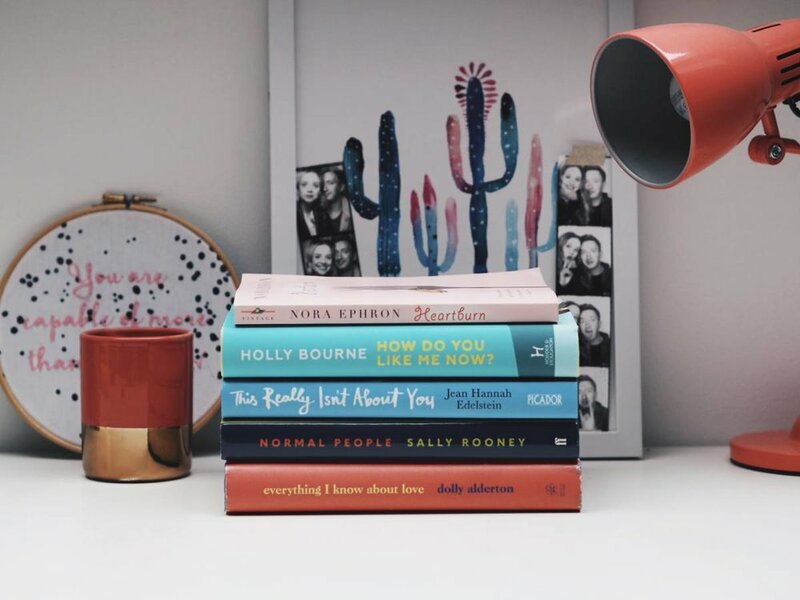 Throughout the novel Holly Bourne explores so perfectly how confusing it is to be a young woman in this day and age, with the pressures of social media and endless decisions to make. It felt much like having a glass of wine with a friend and working through the things on your mind, while also being funny, entertaining and inspiring. A great one to curl up with over the Christmas break. I think this book has won just about every prize going this year, and there’s a reason for that - it’s brilliant. Following the success of Sally Rooney’s debut novel, Conversations With Friends, Normal People charts the relationship of Connell and Marianne, from their first conversations in a small town in Ireland, to the adult lives they make for themselves in Dublin. Rooney writes fiction in a way that makes me seethe with jealousy. She builds characters with real depth and warmth, writes dialogue that has you burning through the pages, and tells stories that will stay with you long after you’ve finished the book. I picked this book up after hearing the author, Laura Freeman, interviewed on The High Low (one of my fave podcasts! ), and I’m so glad I did. It’s a memoir of sorts that documents how reading about food helped to aid Laura’s recovery from anorexia. She writes so beautifully about how the work of Charles Dickens and Virginia Woolf inspired her to try new foods for the first time, or stirred an appetite in her that she hadn’t experienced for a while. It’s a really moving book, and a joyful one too - although it will have you reaching for stacks of toast and squares of chocolate! I’ve been reading Jodi Picoult novels since the age of 13, but I think that A Spark Of Light is one of her best novels yet. It’s set in the last remaining abortion clinic in Minnesota, where a lone gunman has taken the patients, staff and visitors hostage. As with all of Picoult’s novels, this is a gripping, pacey read, but it’s the thorough and in depth exploration of the abortion argument that makes this book special. It’s obvious that Picoult did an awful lot of research before and during the writing of this novel, and as a result she seamlessly weaves together so many different opinions, arguments and perspectives, while never losing a grip on her plot or her characters. This Really Isn’t About You is my one of my most recent reads, but I know that it’s a book that will stay with me for a long time. It’s another memoir, written by Edelstein after losing her Dad and discovering that she had the same genetic condition that caused his fatal cancer. It’s a gorgeous exploration of growing up, travel, death, grief, and our ever changing relationships with our parents. Edelstein’s writing is beautiful, thought provoking and frank, and I devoured this book in just two days. It really stirred something in me, and for that reason I know I’ll keeping coming back to this book for years to come. What have you loved reading this year? Have you read any of the books on this list?